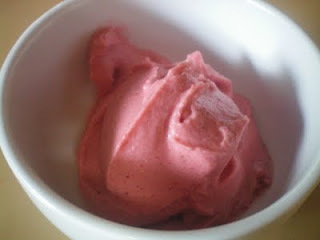 Place the frozen bananas and strawberries into a food processor. Start blending then add in the vanilla and coconut milk. Just enough for it to blend together but not too much, we want it to be really thick! Once it is nice and smooth but still very thick scoop it out and enjoy! It needs to be eaten right away as it will not keep very well in the freezer. Makes 2-3 servings.